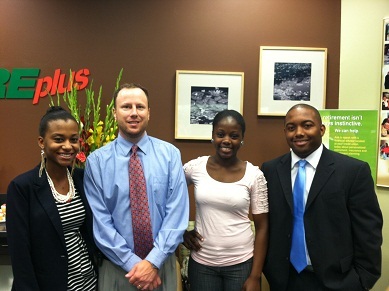 CorePlus FCU in Connecticut recognizes the efforts of its summer learners. From left, intern Ruvitha Charlot, Chief Operations Officer Ray Currier, intern Ronny Tavares and Jamal Paire, branch supervisor. The $202 million, 21,300-member CorePlus Federal Credit Union has recognized its latest summer crop of interns, placing their names on a recognition plaque at the credit union’s Salem Turnpike office in Norwich, Conn., and thanking them for their work.